Safety and cutting rulers from YOW! In the field of advertising technology, numerous tools are used every day to achieve a perfect result, including a very classic tool: the ruler. At YOW! 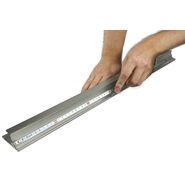 you will find aluminium cutting rulers of different lengths - from 65 centimetres to 1.85 metres - designed for professional use. A safety bar and non-slip rubber coating prevent accidents at work, and the ergonomic shape adapts to all surfaces. In addition, scaling ensures that different materials, such as foil, wood, plastic or aluminium, are cut to size. This ensures uncomplicated handling at all times, and even long cuts can be made in "one-man operation". Another nice extra: the surfaces of the rulers are satin-finished. Find now at YOW! a ruler that supports you in your work perfectly and achieves optimal results!